Welcome to the Northern Territory, where the locals are Territorians (or Top Enders in the North), where tourism rules and where the climate demands your attention. Plan your visit to the Northern Territory and find things to do that’ll take your breath away. The scale of Australia can be disorientating. Take that tiny outcrop at the very top of the Top End, for example. This is Arnhem Land Aboriginal Reserve. And it’s the size of Portugal. Hot springs, great walks and a stunning landscape make for a piece of camping heaven. Unless you’re journeying around the whole of Australia’s coast or tackling the Savannah Way, the Gulf of Carpentaria is a long diversion from pretty much everywhere – but then, that’s part of its appeal. Kakadu is Australia’s largest National Park but some claim it’s all a bit overrated (which has led to it being nicknamed Kaka-don’t). We think it’s one of the things to do in the Northern Territory – and we’d recommend you give yourself 3 days to cover just a small part of it. The gateway to Nitmiluk National Park and the stunning Katherine Gorge, but when you’re planning your visit to the Northern Territory don’t worry about putting this high up the to do list. Find out why. A gorgeous wilderness of scenic waterholes, gushing waterfalls and the strangest magnetic termite mounds you’ve ever seen. Perfect for daytripping, bushwalking and camping. 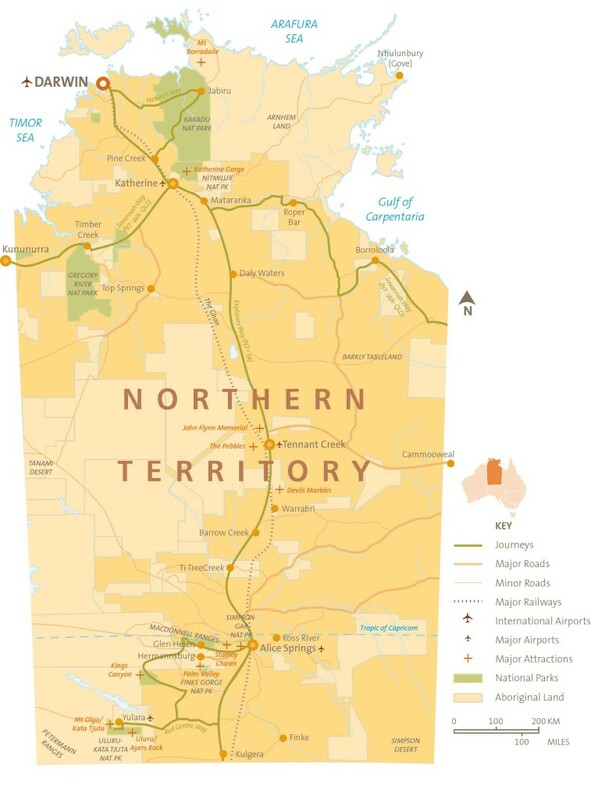 It’s one of the Northern Territory’s most beautiful areas. It’s also a world-class bird watching destination, but the Mary River National Park is a haven for far more than twitchers. People use Mataranka as a base for exploring the nearby Elsey National Park and taking a dip in the thermal pools. Yet there’s history here too – and it would be a shame to miss it. Whether you’re trekking, swimming or taking a scenic flight, Nitmiluk’s mixture of rocky escarpments, waterways, and monsoon rainforest make for a dramatic way to get back to nature. Australia at its most majestic can also mean Australia at its most dangerous. Stay safe in the Northern Territory by understanding when to visit. The red dust conceals many things. Stunning natural wonders. Millennia of aboriginal history. Sights to make the heart soar. Australia’s Red Centre is alive with adventure. Gold rush country, cattle farms and Aboriginal settlements. Experience the archetypal small outback town. 3700km from Broome, WA to Cairns, QLD (or vice versa), passing through 15 national parks and 5 world heritage areas. Now that’s something to write home about. That’s the Savannah Way. 85km south-west of Katherine, along the Victoria Highway, you’ll reach Timber Creek, gateway to the mighty Judbarra/Gregory National Park. If you were to distil and bottle the Australian experience you’d probably end up with the Tiwi Islands. 80km north of Darwin, and nicknamed the ‘island of smiles’ the Tiwis are a sort of greatest hits of Australian culture. Is there a more iconic natural sight in Australia than Uluru? It’s not hard to see why Aboriginals view it as sacred, but there’s more to the area than visiting Uluru. Don’t miss the remarkable rock domes of Kata Tjuta, or the area’s Aboriginal rock paintings. The Stuart Highway (known locally as ‘The Track’) runs from Darwin through Alice Springs down to Port Augusta in South Australia, just 300km north of Adelaide. With so many towns dotted along it, the Stuart Highway makes exploring the Northern Territory easy. The Ghan, affectionately named after the Afghan cameleers who transported food and resources across the outback from the 1860s to the 1930s, is one of the world’s great railways – and one of the world’s epic journeys. Running from Adelaide to Darwin via Alice Springs, the journey takes 2 nights and 3 days. The Ghan runs once a week (twice between June and August). You can find timetables here.